Judging from our viewing statistics, people really liked comedian Jeremy McLellan’s take on the recent discussion over bringing young children to Mass. 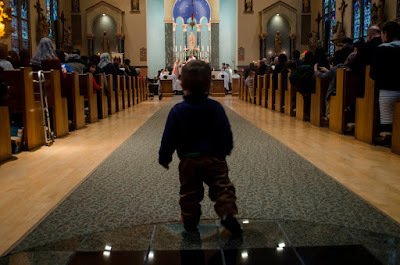 (McLellan was responding to a piece on the blog of Fr Michael White, pastor of Nativity Church in Timonium, Maryland, entitled “Why We Don’t Encourage (Little) Kids in Church.”) On the same topic, I strongly commend to our readers’ attention a superb piece entitled “The Liturgy is for (Little) Kids” at Church Life Journal, written by founding editor Timothy O’Malley, who is also the director of the Notre Dame Center for Liturgy. Here are a few excerpts; you should definitely take the time to read the whole thing. In this sense, Fr. White’s blog post is but endemic of Catholic worship in the United States at this stage. Liturgies are cacophonies of verbal proclamations, of sermons, of explaining rites and the meaning of feasts. There is so little to behold in churches that have been built as suburban shopping malls. Music is chosen not because it provides something to perceive, the beauty of ordered sound used to worship God, but instead to get across a “message” in hymn texts that are often more ideological than aesthetic or theological. There is often so little gravitas to the activity of worship, a sense that we have to adjust ourselves to adore God, since what we long for is a pleasing and meaningful act of worship. Perhaps, what we need to do is not exclude children from the act of worship. Instead, we must understand liturgical worship as if the primary participants in the act of worship will be infants. Instead of relying on endless speech, on communication media including video screens, we must create spaces where all the senses are involved in worship. Emphasizing understanding through speech brackets out a good deal of what it means to be a human being.